As Bitcoin has risen from obscurity, its sheer momentum has forced both the financial world and mainstream media to stand up and take note. During 2017 alone the price of Bitcoin (BTC) has seen gains of more than 1700%. It’s that kind of rise that has critics calling the Bitcoin bubble the greatest they have ever seen. However, there are just as many supporters of the world’s first cryptocurrency, suggest that such lofty heights are a long way short of what its potential truly represents. To call it a Bitcoin bubble in and of itself is difficult. A bubble is often defined as an asset that is trading well in excess of its intrinsic value. The issue with an asset like Bitcoin or cryptocurrencies, in general, is that they technically have no intrinsic value. Supporters argue that fiat currencies also have no intrinsic value. However, by law, taxes in the United States need to be paid in US Dollars. This gives the US currency a true level of demand and therefore a true value. While Bitcoin itself, at this point in time, has only limited application as a form of payment. As such critics argue that it’s simply Bitcoin speculation that is driving the massive gains, which puts it into bubble territory. Given its lack of a true value, many experts point to the obvious comparison between gold, which is a noted store of value, and Bitcoin, which many see as the new digital alternative. Fundamental gold investors have traditionally used the precious metal as a hedge against inflation to protect themselves from economic turmoil. And there are some similarities with Bitcoin in that there is effectively a limited supply. However gold speculators also, buy gold because they believe the price will simply move higher over time. Interestingly the search term, ‘Buy Bitcoin’ has now overtaken ‘Buy Gold’ in Google searches, pointing to heightened enthusiasm for Bitcoin speculation and the belief that it will simply keep moving higher. Famed economists Olivier Blanchard and Mark Watson suggest that these types of bubbles occur because speculators believe that prices will simply continue to move higher over time. And this is where a Bitcoin bubble, becomes more apparent. As retail investors, continue to enter the market, many are simply riding the momentum of what are already exponential returns. And many simply expect that they will be able to sell at a higher price, sometime in the future. Which may or may not be the case as it is effectively Bitcoin speculation. 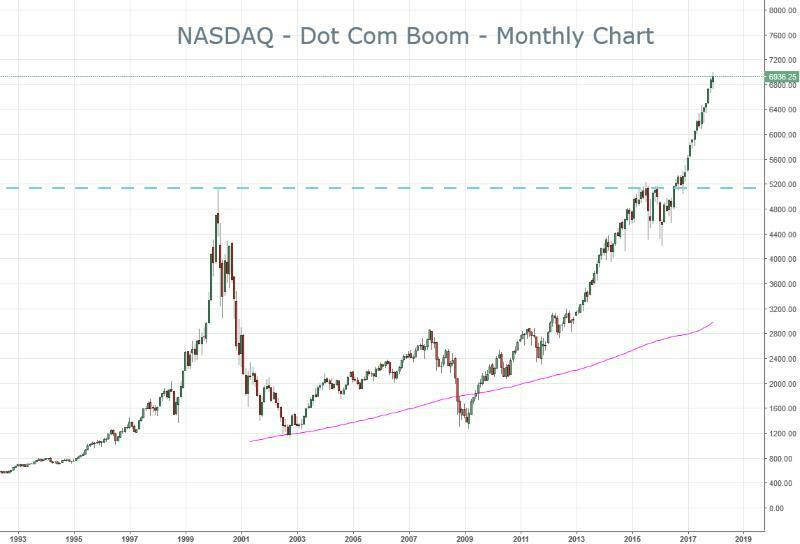 In recent times one of the greatest market rallies that we’ve seen was in the late 1990’s in the form of the dot-com boom. It was a period where the internet was changing the way we interacted and the way businesses operated. And that was reflected in the price of technology stocks. The NASDAQ composite, the benchmark for technology stocks in the US saw a threefold increase in a few short years. However when it eventually crashed it took 15 years to regain its former lofty highs. But what we did see was a raft of new businesses that changed the world. Names such as Google, Amazon, and eBay were all startups as the tech boom was in full flight, but have gone on to shape our modern and business culture. To put the Bitcoin bubble in context, US tech stocks had a value of nearly 1.7 trillion dollars prior to their collapse. As it stands cryptocurrencies are currently around 170 billion dollars meaning there is still potentially more room for the cryptocurrency market to grow. Is the Bitcoin Bubble Actually a Blockchain Bubble? The comparison between the current Bitcoin bubble and dot-com boom is obvious. Bitcoin and cryptocurrencies clearly represent a seismic shift in the way currencies operate. However it might just be the technology upon which they are built, known as blockchain, that is contributing to the lofty valuations. The blockchain is a digitized ledger system that tracks transactions. We are seeing potential applications for blockchain technology in the banking sector, the insurance industry, gambling and forecasting amongst many others. Many pundits are simply betting on the blockchain technology by investing in Bitcoin. They see the long-term future that the technology represents which is contributing to the current Bitcoin bubble status. During the dot-com boom, small penny stock companies tacked on ‘dot-com’ to their company name and saw huge gains in the value of their stocks. We are now seeing similar tactics with Blockchain. Recently a company called ‘Long Island Iced Tea’ added blockchain to its name and saw a 500% gain in its share price. In terms of a purely digital currency, Bitcoin has many rivals. In recent times other cryptocurrencies such as Ethereum, Litecoin, Ripple, Bitcoin Cash and others have been gaining ground. The price momentum and interest in Bitcoin speculation have seen it act as a proxy for many that feel that the new world of digital currencies is here to stay. However, there is unlikely to be room for multiple cryptocurrencies as pure forms of payment. Ultimately one will win the race. Many experts are therefore calling the Bitcoin bubble, simply that of price discovery. The market will determine the price and ultimately which cryptocurrency has the greatest application. Pundits have likened it to the battle between Apple and PC. So is There a Bitcoin Bubble? To truly determine whether there is a Bitcoin bubble, really depends on which side of the fence you’re sitting on. If you believe in the technology and its application, not just as a form of payment, but a game changer – then Bitcoin is likely undervalued. 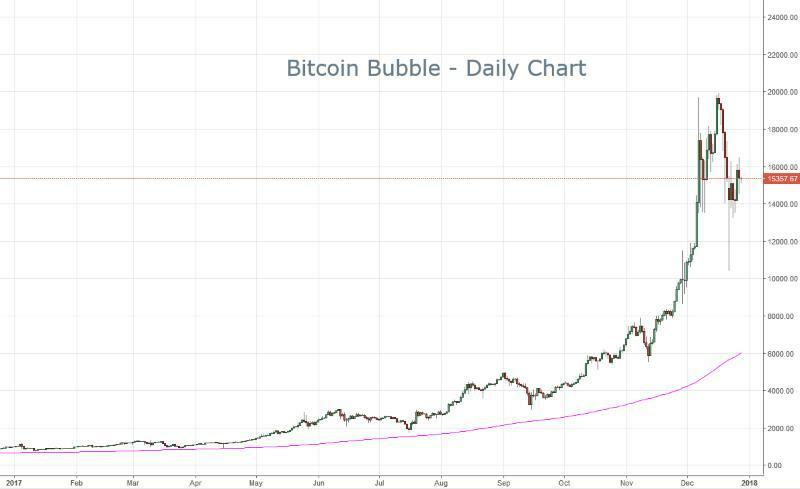 If you think the Bitcoin bubble is just like the penny stocks during the dot-com boom or another gold bug pumping up the precious metal, hoping there is a buyer at a higher price waiting in the wings, then you might believe the Bitcoin bubble is the greatest you’ve ever seen. While the technology advances in the form of blockchain might warrant the current prices, the issue is that Bitcoin itself might not actually be the be the ultimate winner of the cryptocurrency race. Ethereum and even Cardano offer quite a bit more in the way of versatility and application. Bitcoin was built on a foundation of security and is difficult and costly to buy and trade or even use. Ultimately whether there is or isn’t a Bitcoin bubble is really a matter of opinion, but what is for sure is that it will be the market that makes the final decision.